Easily upgrade your 94-95 Mustang GT Master Cylinder to a 94-95 Cobra Brake Master Cylinder with this pre-bent line kit form Maximum Motorsports! If you've upgraded the brakes on your 1994-1995 Mustang GT, you'll need to upgrade your Brake Master Cylinder as well. 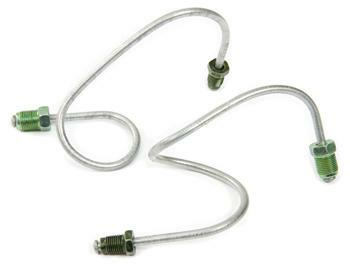 The most popular upgrade is the 94-95 Mustang Cobra Brake Master Cylinder. This Brake Line Kit from Maximum Motorsports allows you to easily adapt a 9495 Cobra Master Cylinder to your 94-95 Mustang GT. This kit includes the brake hard lines and adapter fittings to install the 94-95 Cobra master Cylinder on your 94-95 GT, It fits both the stock brake proportioning valve/junction block, as well as the MM Proportioning Valve/Distribution Block Eliminator Kit MM-MMBAK6). Works with power brake booster only, will not work with manual brake adapter.